Kid & Family Paradise in Collins Lake..just steps to pools and hot tub! 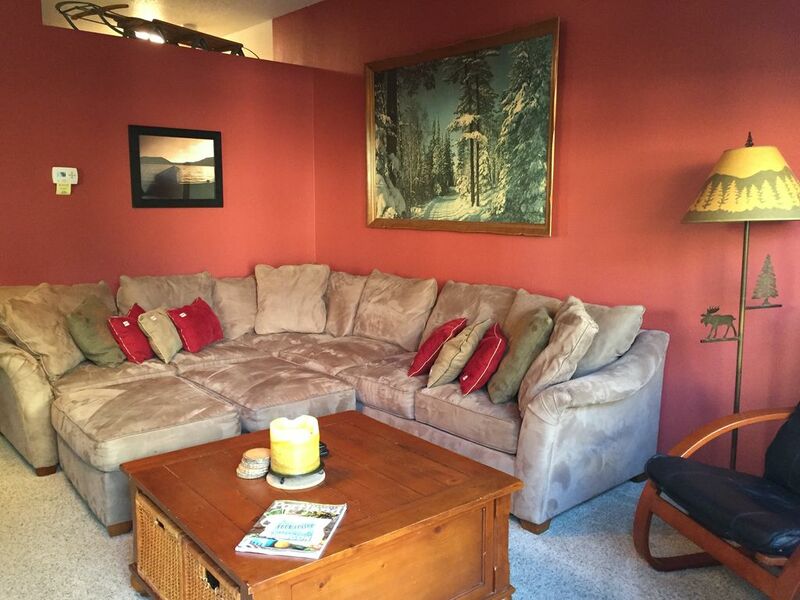 Families ONLY: 3 bedrooms plus queen sofa bed, sleeps 8. Toys, movies, & sleds! The best base camp in the heart of the of Mount Hood. Our home is the most family-friendly option in Government Camp and probably the cleanest too. Enjoy our home just steps from the clubhouse, pool and spa/hot tubs. Expanded video library! We just bought a dozen new movies for both kids and parents, bringing the grand total movie library well over 100. With 3 places to watch movies in the Chalet, everyone can find a movie and a place to enjoy them. We try to be the most kid friendly place on the mountain...while making sure the adults in your group will love it too. Our home is full of fun for families both inside and outside with the heated pool, soaking pool, hot tub and sauna just 50 feet from our front door. This is the place to relax and enjoy the mountain and all it offers no matter what adventure, or simple relaxation you seek. Email us for a link to our photo album with 50 pictures! What to do first? Stroll through Government Camp, walk to the pool, hit the slopes, or simply relax in the sauna. Or perhaps just cook up a great dinner in the cozy and fully-stocked kitchen. Play a board game, play some darts....or just enjoy the fireplace and a movie or magazine. Everything you need is within walking distance. This is our 'Home Away From Home:' you will find spices in the cupboard for cooking up your family meals, an entire bookshelf of kids books, movies to cozy up and watch with hot popcorn, and toys and books for the kids. Email us for our video link and many many more pictures.. We hope you join the group of families who come back season after season to our home on Mount Hood, making it their home on the mountain as well! We have an active family, and enjoy all things outdoors. We love the mountain and all it offers every season of the year. We hope you make our home, your home away from home on Mount Hood. We love Mount Hood in every season. From the massive snowfall to the beautiful warm summer days, it offers a great base camp for every outdoor activity. And with the resort amenities, we have a bit of luxury at the end of any day. Staying at our Chalet offers a very kid-friendly home, chock full of games, toys and sleds. In addition the resort has year round heated pool, 2 hot tubs and a sauna, all just 40 feet from our front door. Well-equipped with pots and pans, crock pots, gadgets like panini makers, quesadilla makers, pancake griddle, nice knives. We love to cook so this is ready to go for you. Spices and condiments also. Free seasonal shuttle to Ski Bowl just steps from front door. You can also ski down from Timberline Lodge on the Glade trail when the snow is deep enough. Hiking/snowshoeing trails on the resort grounds, and nearby in Government Camp. Enjoyed the comfortable home and all the little accommodations that make vacation a relaxing time for everyone! Great, the kids rested and skied well! Thanks, second time and just as enjoyable as the first! We loved it! Cozy, great decor, fully equipped, personal touches throughout, great location!!! Can’t wait to come again! Great condo in Government Camp. Walkable to food/shops/skiing. Garage a great place to store equipment/do laundry. Nice living area and kitchen comfortable with 4 adults and 4 kids. Comfortable upstairs bedrooms once we figured out the heat. Perfect location at the chalets--close to sledding and town and super close to the pools! We had a wonderful time at this property. Everything was clean and super family friendly. We would love to come back in the summer to explore Collins Lake some more.